Cloudy and rainy conditions continue Tuesday as a warm front slowly moves through the area. 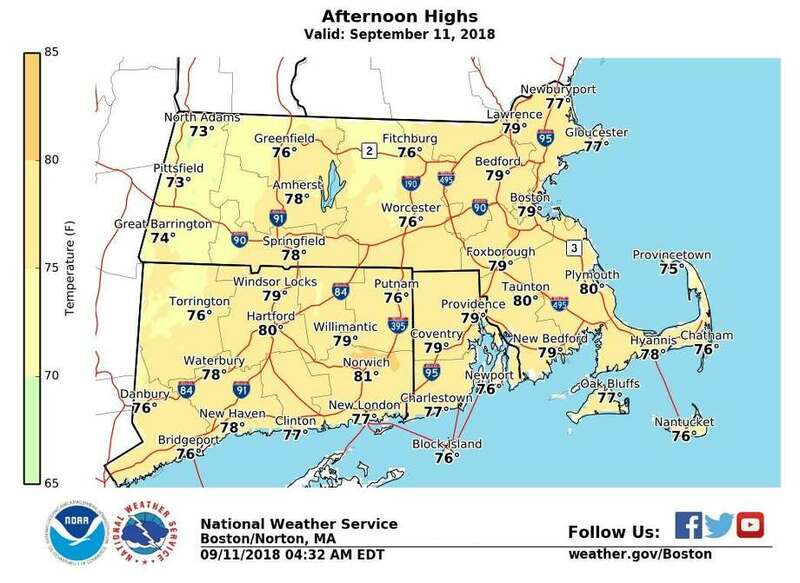 “With ample cloud cover and a cool onshore flow, temperatures will remain below climatological normals in the mid to upper 70s. Fog then develops again tonight, with humidity steadily increasing as the warm front moves to our north,” the National Weather Service says. More coastal flooding is during high tide on Tuesday. A Coastal Flood Avisory is from noon to 2 p.m.
Expect around 1 feet of inundation above ground level in low lying, vulnerable areas. Some roads and low lying property including parking lots, parks, lawns and homes/businesses with basements near the waterfront will experience shallow flooding. More than an inch of rain fell in parts of Connecticut on Monday, according to the Community Collaborative Rain, Hail and Snow Network. Rainfall totals include: 2.05 inches in West Hartford; 1.87 inches in Stamford; 1.75 inches in New Hartford; 1.61 inches in Darien; 1.35 inches in Norwalk; 1.30 inches in Wallingford; 1.24 inches in Brookfield; 1.19 inches in Bethel; 1.14 inches in Madison; 1.13 inches in Stratford; 1:07 inches in Milford; and 1.02 inches in Shelton. Year to date rainfall is 4.32 inches above average at Sikorsky Memorial Airport in Stratford and .79 of an inch above average at Danbury. Tweed-New Haven airport is 1.92 inches of rain below average for the year. Today: A chance of showers and thunderstorms before 2 p.m., then showers likely and possibly a thunderstorm between 2 and 3p.m., then a chance of showers and thunderstorms after 3 p.m.. Areas of fog before 10 a.m. Otherwise, mostly cloudy, with a high near 76. North wind around 6 mph becoming calm in the morning. Chance of precipitation is 60 percent. New rainfall amounts between a tenth and quarter of an inch, except higher amounts possible in thunderstorms. Tonight: A 40 percent chance of showers and thunderstorms. Areas of fog. Otherwise, mostly cloudy, with a low around 70. South wind around 5 mph becoming calm in the evening. Wednesday: A 50 percent chance of showers and thunderstorms. Areas of fog before 10am. Otherwise, mostly cloudy, with a high near 80. Northeast wind around 6 mph. Wednesday night: A 50 percent chance of showers and thunderstorms. Cloudy, with a low around 70. East wind around 6 mph. Thursday: A 40 percent chance of showers and thunderstorms. Cloudy, with a high near 76. East wind 7 to 9 mph. Thursday night: Cloudy, with a low around 68.